Beautifully engraved certificate from the California Street Cable Railroad Co issued in 1928. This historic document was printed by Schmidt Litho and has an ornate border around it with a vignette of two cable cars. This item is hand signed by the Company's President ( Jas. W. Harris) and Secretary and is over 83 years old. Punch and pen cancelled. San Francisco's cable cars are unique in that they are the only street railway in which the cars do not operate under their own power. Instead, the cars are propelled mechanically, by "gripping" and "ungripping" a continuously moving steel cable which runs in a conduit underneath a slot between the rails. The cable, in turn, is kept in motion by an engine in a centrally-located powerhouse. The world's first first cable-powered street railway was built in San Francisco by Andrew Hallidie in 1873. During the next fifteen years, many cities in the U.S. and elsewhere built cable railways to replace horse-powered streetcars. When electric streetcars became practical in the late 1880s, they in turn quickly replaced cable cars almost everywhere. Fittingly, San Francisco is now the last city in the world to operate cable cars. The last previous survivor in the U.S. was Seattle (1940); abroad, Dunedin, New Zealand (1957). 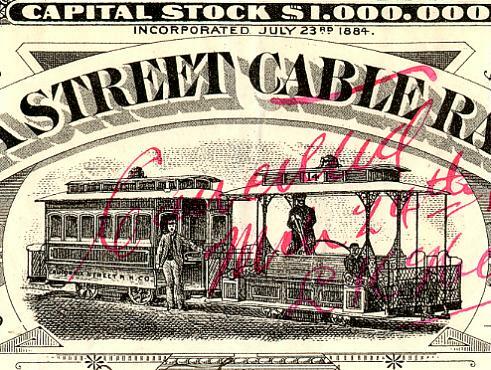 California Street Cable Railroad. Three lines, 3�' gauge, side grip on California St. line, bottom grip on the other two. Service from April 1878 to July 1951. The City and County of San Francisco purchased the California Street Cable Railroad in January 1952. The California Street line runs from Drumm Street (near Market Street) to Van Ness Avenue. It was built in 1878 by the California Street Cable Railroad Company, which also operated the O'Farrell/Jones/Hyde line and the Jones Street shuttle. Since 1952 it has been operated by the San Francisco Municipal Railway. The line originally extended to Presidio Avenue, but was truncated to Van Ness in 1954. It uses double-ended cars which were built after the great fire of 1906.